Jason Walford Davies graduated in Welsh at Bangor University in 1993, and was appointed the same year to a lectureship in the Department of Welsh.. 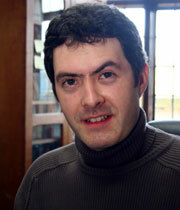 He is currently Senior Lecturer and Co-Director of the R. S. Thomas Research Centre at the University. Following the appointment in 1999 of R. S. Thomas (1913–2000) to an Honorary Professorship in the Department of Welsh, a special Research Centre was set up in recognition of his poetic achievement and in order to promote research into his work. The Centre's archive contains all of R. S. Thomas's published works, together with an unparalleled collection of critical books, articles, reviews, interviews and audio-visual material. The Research Centre is available to visiting scholars. Jason Walford Davies’s main research interests are medieval and twentieth-century Welsh literature, and Welsh Writing in English. He has written extensively on the work of R. S. Thomas; his publications include R. S. Thomas: Autobiographies (J. M. Dent: 1997) and Gororau’r Iaith (‘The Borders of Language’) (University of Wales Press: 2003). The latter is a critical survey of Thomas’s relation to the Welsh literary tradition and was placed on the shortlist for the Arts Council of Wales/ Welsh Books Council Book of the Year Award, 2004. His critical edition of R. S. Thomas’s correspondence with Raymond Garlick (which spans half a century) was published by Gomer Press in 2009. 2006 saw the publication of his co-edited collection, Cof ac Arwydd: Ysgrifau Newydd ar Waldo Williams (‘Memory and Sign: New Critical Essays on Waldo Williams’) – a volume that contains his extended linguistic study of this major twentieth-century poet’s work, ‘“Pa Wyrth Hen eu Perthynas?”: Waldo Williams a “Chymdeithasiad Geiriau”’ (‘Waldo Williams and the “Sociability of Words”’). Jason Walford Davies has been commissioned by the University of Wales Press to write a biography of Waldo Williams in the ‘Dawn Dweud’ series, and Gomer Press has invited him to edit the definitive critical edition of Waldo’s poetry. He is the editor of Gweledigaethau (‘Visions’) (Cyhoeddiadau Barddas, 2007), a volume of critical essays in honour of Gwyn Thomas – Emeritus Professor of Welsh at Bangor University and former National Poet of Wales. In 2004 Jason Walford Davies won the Crown at the National Eisteddfod of Wales with his poem ‘Egni’, which commemorates the Miners’ Strike of 1984–5. He is currently preparing a collection of his poems. He has served as an adjudicator in the Crown competition at the National Eisteddfod of Wales on two occasions – at Llanelli (2000) and Bangor (2005). He is a regular contributor to radio and television programmes on the arts, and recently presented Cymru a’r Chwyldro Diwydiannol (2006), a four-part documentary series for S4C on Wales and the Industrial Revolution.